This fall something quite extraordinary happened for some small communities up in Alaska. President Obama came to town! I was thrilled to see Obama in Dillingham. 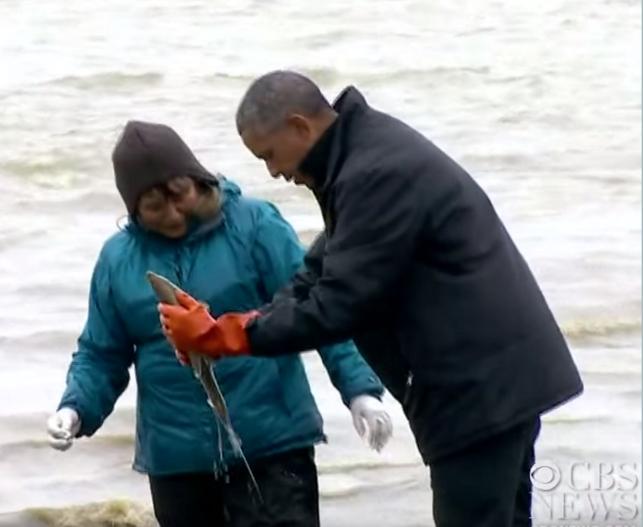 My friend, Katherine, had a chance to take a walk with Obama and talk about the commercial salmon industry which she reflects on on her Facebook page. I can’t help but smile when I see Obama doing traditional Y’upik dances in the Dillingham gymnasium… the same gym where we presented our personal stories to EPA in regards to their assessment of the Bristol Bay watershed and what a copper and gold mine could possibly do to damage it. Or the time that a salmon milted on Obama’s shoes. So funny! President Obama also took over his Instagram site and offered some insights into what he was doing in Alaska. The purpose of Obama’s visit was to highlight the issues of climate change but in the 49th state, it was validation for a way of life that they’ve been living for generations. It was also a way for Obama to make a direct nod to the importance of wild salmon and to address the issues of exploratory gas and oil drilling. What’s troubling about this is that Obama did allow for drilling in the Chukchi Sea. If you weren’t paying attention, this was what all the fuss was about regarding Shell and the “kayactivists” that blockaded their drill rig in Oregon. The public outcry was resounding and the good news is that Shell abandoned their Arctic drilling plans when their exploratory drilling failed to produce. Surely the public outcry helped. In the future, we will hear more from Obama – about Pebble Mine, about climate change…. no doubt this trip felt like a nod of acknowledgement to a region and it’s way of life.